Who thought up this food holiday, you might ask? Why not Blackberry Waffles Day, or Milk Chocolate Chip Waffles Day? We’re guessing that Oatmeal-Nut Waffles Day is the work of nutritionists at the Whole Grain Council or some other group supporting oats—and they’re not wrong. Waffles are a great way to limit portions of nuts (unlike, say, eating an entire bowl of mixed nuts). 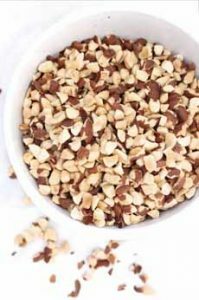 Almonds, hazelnuts, peanuts, pecans, some pine nuts, pistachios and walnuts are approved by the FDA, since they contain less than 4g of saturated fats per 50g. Walnuts are your best bet—they are more heart-healthy than olive oil and have bone-healthy alpha-linolenic acid (ALA), an essential omega-3 fatty acid). But if you must have pecan waffles, we understand. Oatmeal or other whole grain waffles are better than white flour waffles. Nuts add protein. Photo courtesy Turvs.net. Chop the nuts to the fineness you prefer (photo of almonds courtesy Big Tree Organic Farms). 1. PREHEAT a lightly greased waffle iron. 2. COMBINE the flour, oats, nuts, baking powder, cinnamon and salt in large mixing bowl. Set aside. 3. MIX the eggs, milk, butter and brown sugar in small mixing bowl. Add this to the flour mixture, stirring until blended. 4. POUR the batter onto the preheated waffle iron. 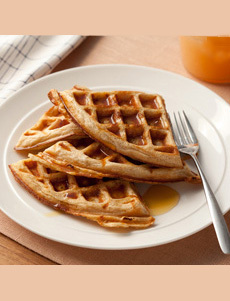 The waffle iron needs to be hot enough to make a cold drop of water “dance.” When it’s hot enough, add the batter. Close the lid quickly, and do not open during baking. TIP: Cooking time varies by waffle iron, setting chosen, if the iron surface is coated (e.g. with Teflon), how much moisture is in the waffle batter, etc. You will need to experiment with your waffle iron. Look for steam escaping from the sides. When the steam stops, the waffles should be finished. 5. REMOVE the finished waffles with a fork. Top with syrup or fresh fruit and/or yogurt. HOW MANY TYPES OF WAFFLES HAVE YOU HAD? Check them all out in our Pancake & Waffle Glossary, along with the history of waffles.